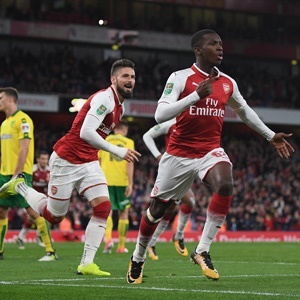 Cape Town - Striker Eddie Nketiah was delighted to have made an impact on his home debut for Arsenal as he netted a brace in the 2-1 Carabao Cup win over Norwich City on Tuesday. The Gunners were trailing the Canaries until late into the game, but the 18-year-old Nketiah came off the bench and, seconds later, scored the equaliser with his first touch of the game in the 85th minute before heading home the winner in extra-time. Nketiah made his first senior appearance for Arsenal in the 4-2 win against BATE Borisov in September, and was beaming after the fans at the Emirates Stadium were chanting his name on his home debut. "I'm just delighted to make my home debut and score two goals for Arsenal. It's a great feeling for me and my family," Nketiah told Sky Sports. "To hear the fans screaming my name, it's been a childhood dream for me. Hopefully it's just the start and you will see many more goals and better performances from me. "It made me feel very privileged to be welcomed by the fans. I just want to continue impressing the fans because they mean a lot to the club and to me." Almost immediately after his heroics Arsenal fans were quick to hilariously edit the youngster's Wikipedia page to describe his bio as 'the greatest player of all time'.